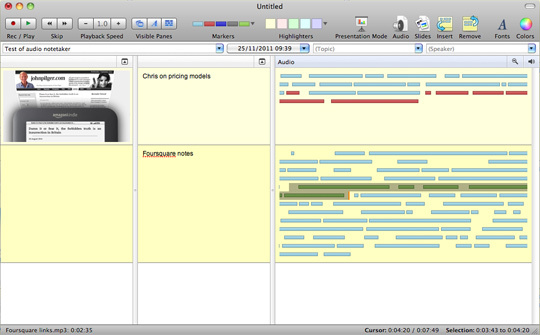 Audio Notetaker, software designed to help journalists record interviews, organise quotes and add notes and images to specific points in a recording, has launched a Mac version. The software, made by UK-based company Sonocent, has previously been available for PCs. It is also aimed at students attending lectures and people attending meetings with a need to record and navigate through audio. Both versions offer a 30-day free trial, which allows you to test it out before you buy. The platform allows you to import or record audio, displaying it as bars (see picture below). The spaces between bars signify pauses where the speaker has taken a breath between sentences. Audio Notetaker also allows you to re-order and edit the recording. You can highlight various bars, making it easy to find a quote in the recording, no doubt a useful feature for journalists working on a complex and legally sensitive story as audio can be labelled. The free trial version comes with a lengthy tutorial introducing you to the platform. After the month-long period trial expires costs are £47.99 for a once-year licence or £95.99 for a a full licence. This entry was posted in Handy tools and technology and tagged Audio, audio notetaker, sonocent on January 18, 2012 by Sarah Marshall.